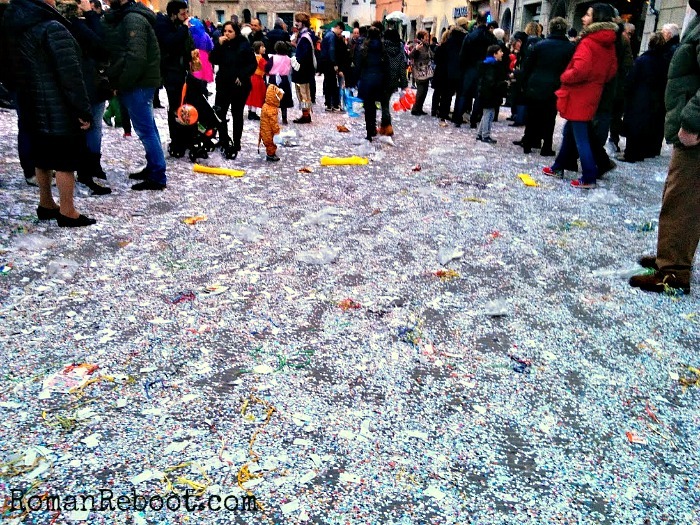 A few weeks before Ash Wednesday, I noticed some confetti scattered around the playground at Villa Borghese. Cool, I thought, some kid must of had a birthday party. Then I started noticing it at other playgrounds. And on the streets. And basically everywhere. You can see where this is going . . . 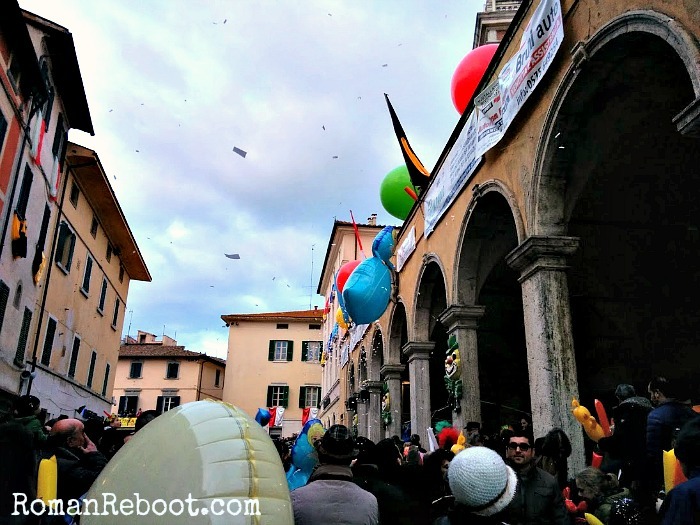 Turns out, this was all Carnival, or Carnevale here, related. It felt like a secret society at times. 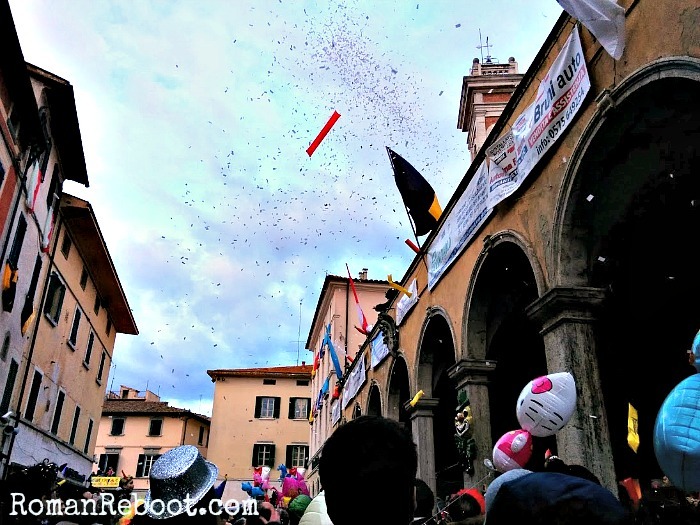 You don’t know when or where, but at some appointed time Italians will assemble and throw confetti (coriandoli) and silly string at each other. 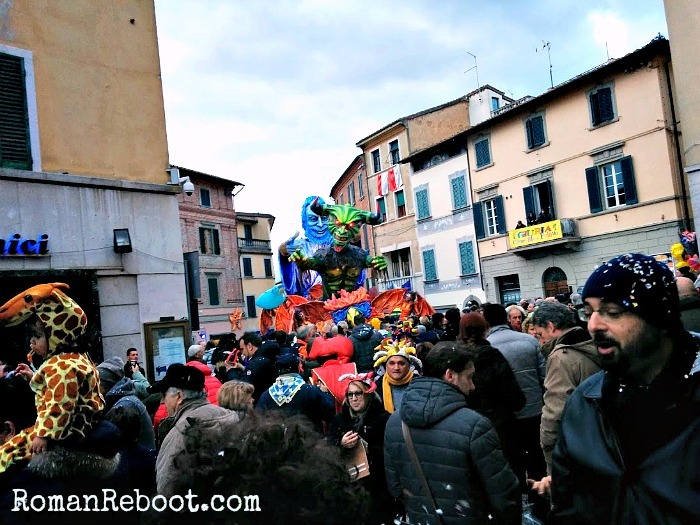 In addition to confetti, silly string, and balloons, Carnevale means dress up. The toy store around the corner trotted out all the costumes you didn’t see at Halloween. I dropped Henry at school the Thursday before Ash Wednesday and missed the dress up day memo. In my defense, it was early days on school. Also, NO ONE told me. Everyone just seems to know. Secret society. 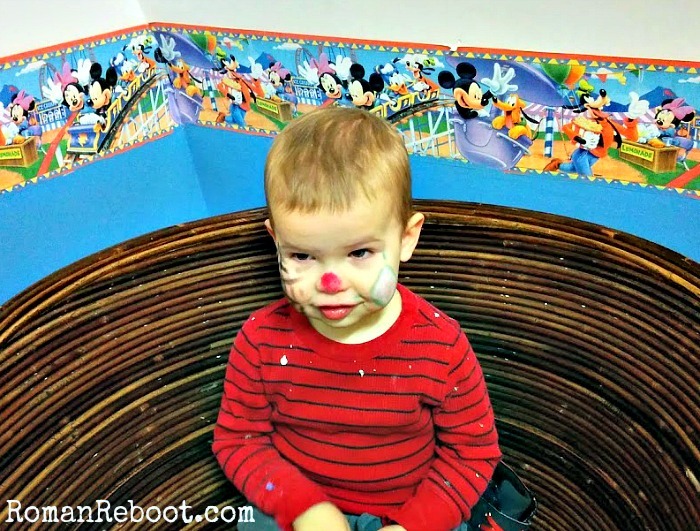 Luckily, Henry was pretty psyched about the face painting and did not comment on his lack of costume. Things intensified as we approached Fat Tuesday. More dress up. More confetti. More streamers. I don’t know why this surprised me. I just didn’t realize it was a thing. Mardi Gras in New Orleans. That’s a thing. Carnival in Rio. That’s a thing. 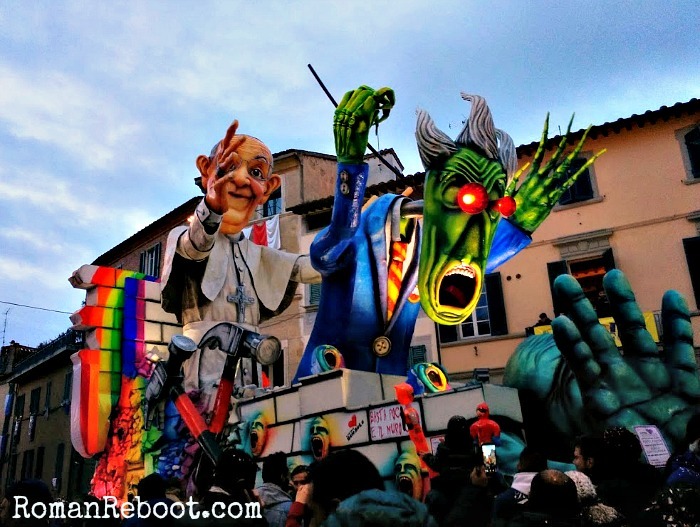 Carnevale in Venice. That’s a thing. But Rome (and apparently many other places in Europe)? I didn’t know. 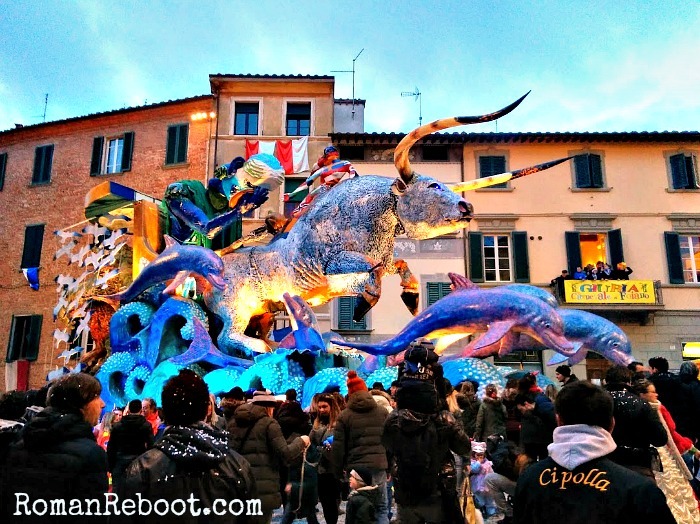 Carnival is DEFINITELY a thing in Tuscany. Coincidentally, our trip to Montepulciano with my mom occurred the weekend before Lent. 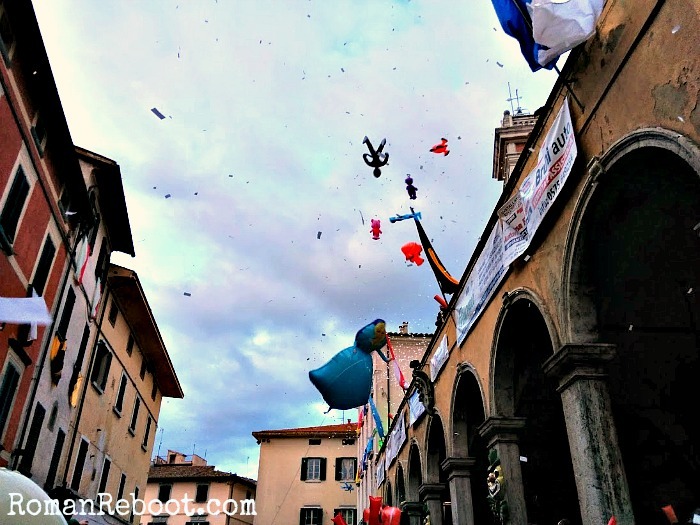 A friend helpfully sent me a list of major celebrations in Tuscany, noting that we would be close to Foiano della Chiana, home of the oldest carnival celebration in Italy. We played it by ear. I wanted a more relaxing trip instead of stuffing everything in. The hills in Tuscany make distances deceptive. In the end, we did go. Adults paid an admission into town (I think 8 euro). We got there just in time for the confetti cannon. I KNOW. Hang on. Let me set the scene. It was crowded, but not scary crowded. I wasn’t worried about being crushed or separated from my group. Vendors sold bags of confetti and horns. 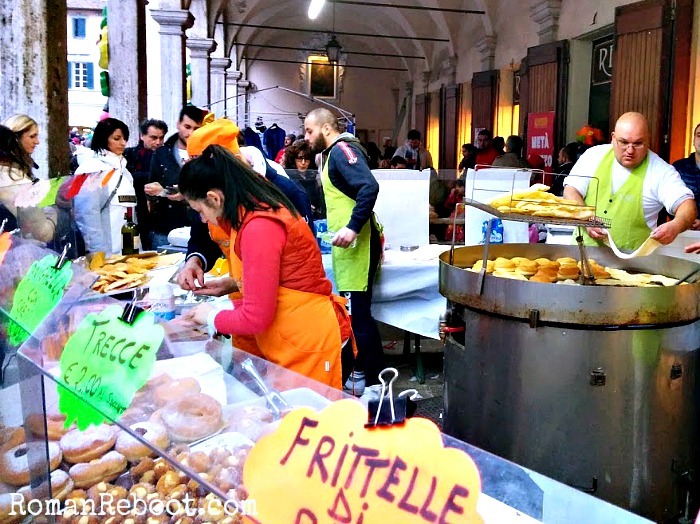 There were also food vendors galore selling yummy fried things. You could even get hot wine, but it was not as good as at the German markets. The crowd was, shall we say, festive. I think at least a quarter of the participants were in costume. Most frequently costumed were kids and groups of bros, although there were some ladies as well. These were not elaborate historical costumes like you’d see in Venice. It really just looked like Halloween was happening in February. It was loud. Between people shouting and music blaring, you weren’t having an intimate conversation with anyone. OK, back to the confetti cannon. In the super old and fancy town hall in the main piazza, revelers lined the balcony, kind of like balconies on Bourbon Street. We stood to the side of the scrum below. After a countdown, the confetti guns fired. These were sort of a letdown. Just long tubes with some confetti shooting out. But that was not all. The group up top rained down confetti as the cannons fired. Everyone down below threw confetti as well. After that stopped, they rained down inflatables. Nemos. Spidermans. Peppa Pigs. James lost his glasses trying to grab one, but luckily they were recovered before someone could stomp them. THEN, they tipped ginormous balls down into the crowd for some serious volleyball action. It was a little surreal. Turns out it was one of three incredibly elaborate floats we saw. The floats seemed to be part of a very slow moving parade. Slow moving because the route was in no way cleared and they were sort of just moving through the crowd. They all had multiple moving pieces, like a bull shaking its head and dolphins leaping. It was a sight to behold. They also had music THUMPING out of the speakers. Mac was tolerant, but unflappable Henry was flapped. We backed off and left a little bit later, picking up delicious porchetta sandwiches for the drive home. 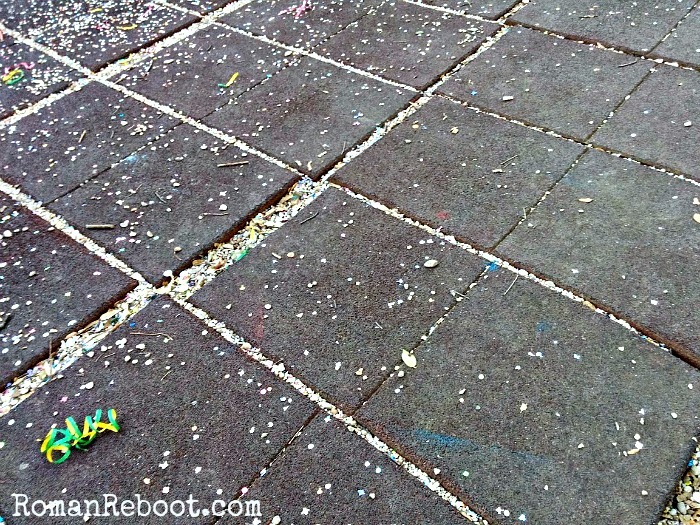 When we got home, we found confetti everywhere. In our shoes. In our hair. Somehow in the kids’ diapers. So, yeah, Carnival. Definitely a thing here.